Garlic Festival Foods Garlic Festival Foods Salad and Bread Dipper Pack - All the ingredients to make a fabulous bread dipper! 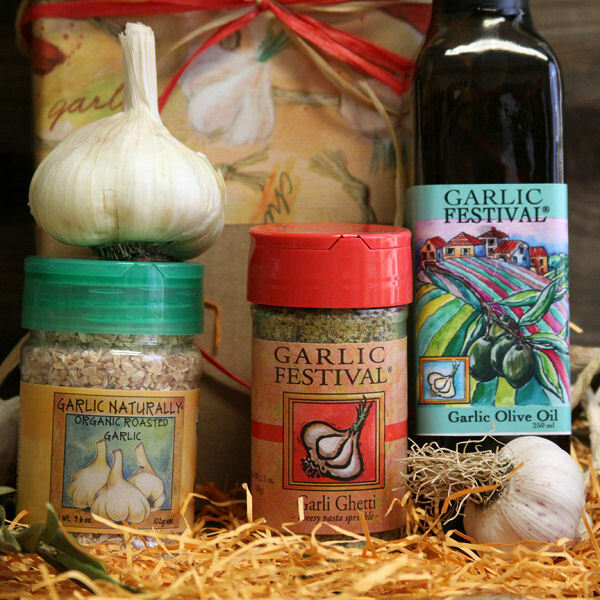 Nestled in a decorative gift box you will find a bottle of our delicious new Garlic Festival Olive Oil (your choice of Garlic Oil or Garlic Chili Oil, Organic Roasted Dehydrated Garlic, your choice of either our Garli Garni, Low Sodium Garli Garni, or Garli Ghetti seasoning and a recipe card; everything needed to make your own fresh salad dressing or tasty bread dipper. Fresh garlic bulb included when in season.